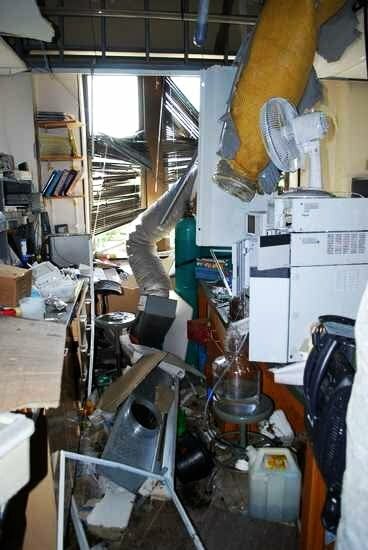 Explosion at MU left this lab decimated. Image Here. Earthquakes, hurricanes, tsunamis, these disasters can wipe out a power grid and compromise the delicate samples and expensive reagents that need to be stored below freezing. The most well-prepared labs, with redundant systems and back-up generators, still have only a finite time before they go dark and their freezers fail. For labs with fewer resources, even short, local power outages can compromise their cold storage. 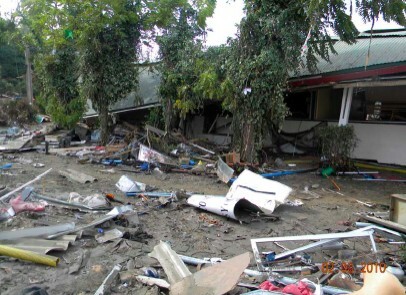 The University of Concepción Marine Laboratory was almost completely demolished in the 2010 Earthquake/Tsunami. Image Here. Ice cream is made by mixing large-granule rock salt (sodium chloride) with ice. Ice requires energy to melt, and by adding salt, you’re lowering the freezing point and increasing the amount of energy needed to trigger a phase change. Give the mixture a vigorous stir and you’ll see some ice phase into water, than back into ice. Drop a thermometer in, and you’ll see the temperature drop quickly. Practically, you’ve just made ice colder. How much colder? Mixing 30% rock salt to 70% ice will lower the temperature to between -20 and -30C, cold enough to keep most samples safe, at least for a while. A 50-lb bag of rock salt costs less than $10, so grab a couple, stick them somewhere out of the way, and hope you never need to use them. It’s not just natural disasters that can knock out your freezer. A blown motor or other mechanical failure can take your critical systems offline. A HappiLabs Lab Consultant can help you pick the best, most reliable equipment for your laboratory. Fast forward to 2012…Lisa is the Laboratory Sustainability Analyst at UIC. She helps scientists recycle lab supplies and safely dispose of hazardous materials. 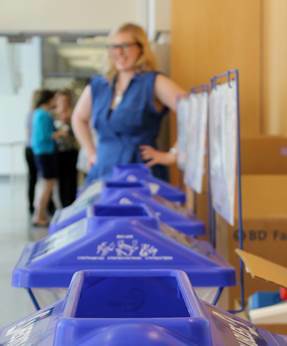 One of her biggest accomplishments to date is the Pipette Tip Box (PTB) Recycling Program. Did you know PTB’s are 100% recyclable??? The PTB Recycling Program at UIC includes 56 bins in 10 buildings on campus. From July 2011 through November 2012 (see graph) the program has diverted 4,660 pounds of plastic from landfills and into the recycling stream. That’s roughly 29,000 boxes of pipette tips! If your university is not recycling PTB’s and you want to start making a difference, find out who your Sustainability Analyst is and put them in touch with Lisa. 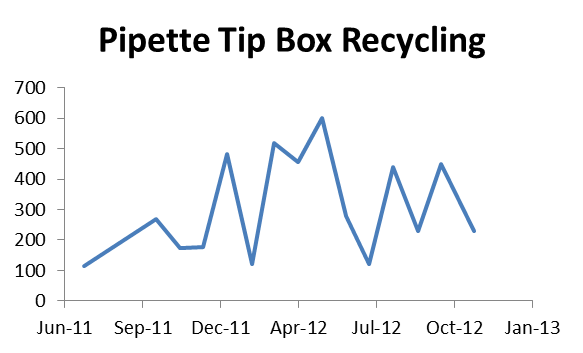 Results of the pipette tip box recycling program. Y-axis is pounds of plastic recycled. Turn off the lights! It sounds easy, but don’t forget about plugged in equipment, Biosafety cabinets, and fume hoods. Equipment that is off but plugged in can still pull electricity. Unclutter your lab. You’ll be amazed at how many labs purchase items they already have. Every duplicate purchase includes packaging materials, energy associated with shipping, and wasted grant money. Here are three unconventional professional development tips from my experience as a grad student that can help you be more a happier and more productive graduate student. A few weeks back, we looked at several 3D printed objects that can help reduce cost in your laboratory. 3D printers have the potential not only to help scientists produce their own cheap consumables, but can also make complex, innovative tools. Advanced 3D printer users have access to myriad opportunities to expand their research. Here are 3 of our favorite advance 3D printing projects for scientists. 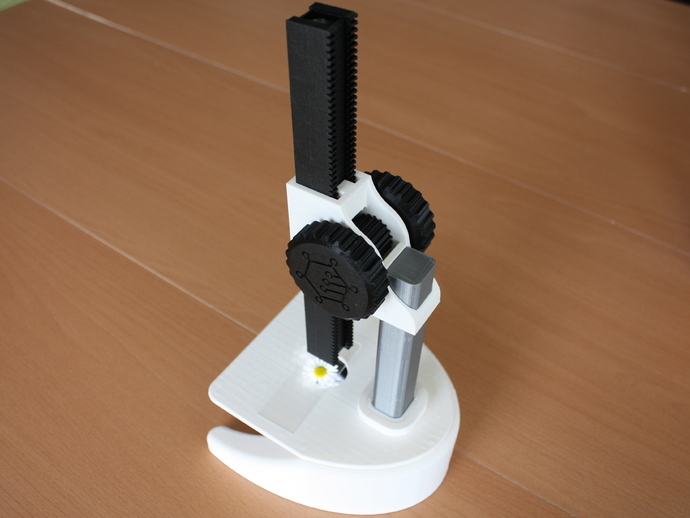 A Fully Printable Microscope: It may not be the highest quality microscope on the market, but this 3D printed beauty is perfect for taking into the field, the classroom, or anywhere else that you need a microscope but don’t want to risk your expensive, high-end models. Swiss Army Tube Block of Science: An awesome tube rack that can handle all six common sizes for sample tubes – 0.2mL, 0.5mL, 1.5/2mL, 5.0mL, 15mL, and 50mL. This is an incredibly handy item to have around the lab for those big, multi-volume projects.